The little bite sized babies might be cute, but watch out – they pack a little punch! I love jalapeño poppers AND buffalo chicken so I decided to combine them both and really spice things up! A few more of my favorite party apps are the Buffalo Chicken Dip, Mini Bell Peppers Loaded Turkey “Nachos”, and Hot Spinach and Artichoke Dip. These are so good and real easy to make. Prep them ahead and bake them just before you’re ready to serve. They should be served hot, so don’t bake them ahead. If you want to go carb-less or gluten free, I think they would be good without the panko too. Just please do yourself a favor and wear gloves when you cut the peppers. The little bite sized babies might be cute, but watch out – they pack a little punch! 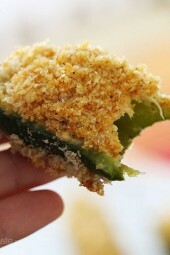 I love jalapeno poppers AND buffalo chicken so I decided to combine them both and really spice things up! Preheat oven to 350°F. Spray a baking pan lined with parchment or foil with cooking spray. Mix in shredded chicken and hot sauce. Fill peppers with chicken cheese filling with a small spoon or spatula. Dip peppers in egg, then in panko mixture to coat and place on prepared baking sheet. Spray the peppers with more oil and bake until golden, about 25 to 30 minutes. Remove from oven and serve immediately. Serve hot, make 20. Could you do these in the air fryer? Would you be able to freeze these ahead of time then bake them when you’re ready to eat them? These look awesome! If I make them the night before whats the best way to heat them up? Back in the oven? To save carbs and increase protein substitute crushed pork rinds for panko. Does anyone think it's possible to make these part of a dinner? Like, serve some with a salad? or soup, maybe? These are amazingly good! 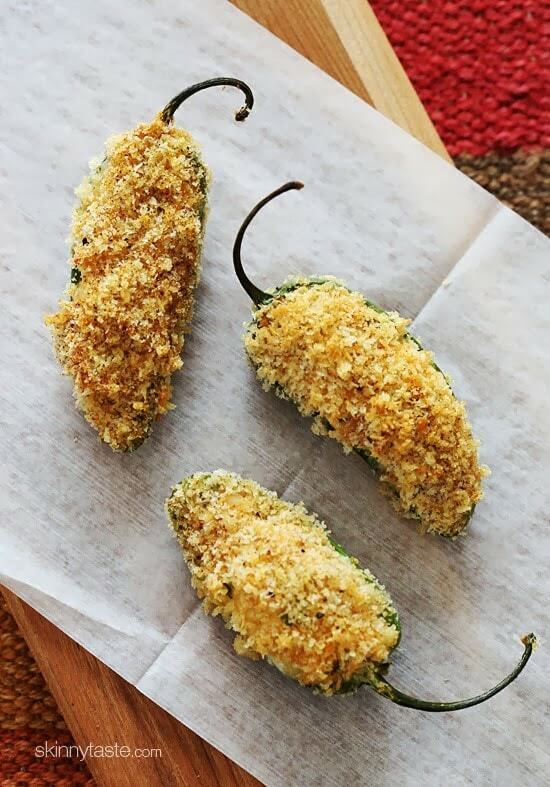 These or your regular jalapeño poppers are a weekly staple for football watching. They freeze well to, just reheat in oven. Would it still work if I replaced the hot sauce with sriracha chilli sauce? I modified the recipe a bit to make it vegetarian. I left out the chicken and egg whites, and just patted the bread crumbs on top of the cream cheese mixture. It turned out great and was delicious! Question. you can take out the panko? and if so do you also rwmove the use of the egg whites? These look amazing. Thanks for the Cabot shout out! I made these this weekend and they were amazing. I went a little crazy and instead of the bread crumbs, wrapped in bacon. I guess it sort of defeated the "skinny" part but SO amazing. Does this make 10 or 20 poppers. Also are 2 poppers 2 points? Want to make sure I know how to read details about recipe accurately. I could probably set the whole batch by myself in one sitting. Just don't want to use all my points for the day on these!!!!!! Made these for Super Bowl and they were fantastic! Couldn't stop eating them! I breaded some and not others and they tasted great both ways. Can't wait to make them again. Oh yummy! These look outrageous! So incredible! I wanted to make wings & poppers for the Super Bowl …but came across your recipe at just the right time (this seriously somehow always seems to happen). Only breaded the tops and made homemade breadcrumbs from a loaf of leftover whole wheat french bread from dinner last night. Turned out perfect, and they were a HUGE hit for my Super Bowl gathering! Thank you! Made these tonight!!! Awesome!!!! Can't stop eating them! I found a new product, Greek Cream Cheese. Check it out! 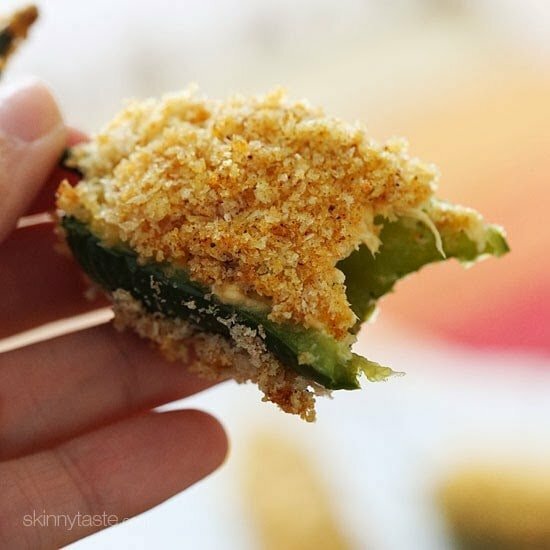 Your original jalapeno popper recipe is one of my absolute favorites from you, this just takes it up another notch! hi is the shredded chicken already cooked? I believe so yes – it would be cooked – I'm not sure you can actually shred uncooked chicken. I prepared these last night for baking this evening! I skipped the egg and just sprinkled some panko bread crumbs on top. I was worried that the filling would fall out if I tried dipping them in the egg. Did you have any issues with dipping? wow thanks for the recipe. These sound so good. Gonna make them for superbowl. We love anything hot and spicy. Do you think these could be made lower carb by leaving off the egg and panko crumb mixture. Would this work? Leaving off the egg won't make it lower in carbs, however, you can use crushed pork rinds instead of bread crumbs. They look like cute little mice! I love food with a bit of a bite. 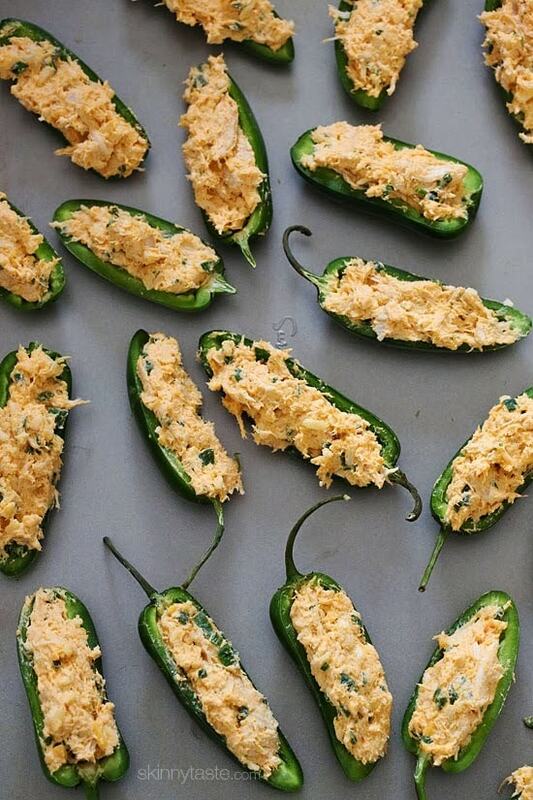 These are the perfect super bowl snacks for my husband and I.
Oh my gosh, these look amazing…buffalo chicken AND jalapeno poppers? I'm in heaven already. These look like they'd be a great lunch too! 2 of these poppers with a piece of fruit, maybe a cheese stick and/or some veggies, would make for a very filling and satisfying lunch. I've been looking for a healthy Super Bowl recipes, and these look perfect! Have you ever tried stuffing sweet mini peppers with hummus instead of cream cheese? My local grocery story offered samples of hummus-stuffed sweet mini peppers last summer, but I lost the recipe and would like to try it at home because my husband doesn't eat dairy. Thanks for sharing so many easy, healthy recipes. Hope your cookbook comes out soon! yum! Bet that would be good! Arby's used to have jalapeno bites with some sort of sweet berry sauce for dipping. Now that I have this perfect recipe for a delicious popper, I need to think up a sweet sauce that still fits in with my weight watchers diet! They have them back. Just had them yesterday. Yummy !! We use Thai sweet chili sauce for our poppers. Caravelle and Mae Ploy are the best brands. Hnnnngggggg. Looks so good! I must try. Maybe I'll blog about my attempt and give a shoutout to my favorite cooking blog! Thanks so much. I'm making these for the Super Bowl this weekend. YUMMY! These look great. I'm curious if you think it work work and possibly reduce the calories further to use laughing cow cheese instead of the cream cheese? Well that depends on whether you want it to be healthy or low-cal. Big difference but people seem to equate one with another. Laughing cow is not even real cheese…it's not far off from Velveeta or Cheez Whiz but people seem to think it's a good alternative just because it's low cal. I've made these with sweet peppers and laughing cow cream cheese only and they are delish also!